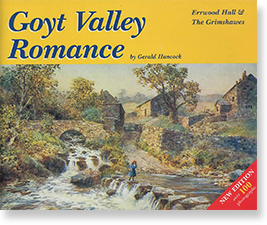 I’ve always loved the Goyt Valley, so was delighted when I first came across Gerald Hancock’s book, ‘Goyt Valley Romance’. Published in 2001, it was to be the last of Gerald’s three books on this magical part of the Peak District. He sadly died in 2013. It’s a great pity that his book is now out of print and second-hand copies are so hard to find. The 60 page book includes over 100 photographs and some wonderfully detailed information on the history and families of the Goyt Valley. Gerald’s wife, Christine, kindly gave me permission to reproduce sections of the book on this website, together with some of the wonderful photographs Gerald managed to collect. One of the images I’d love to find is the cover illustration (above), showing a young girl precariously crossing the stepping stones in the heart of Goyts Bridge, with the packhorse bridge behind her. If anyone has a copy, please do get in touch.